How can we explain the apparent rise in hatred in societies around the world? 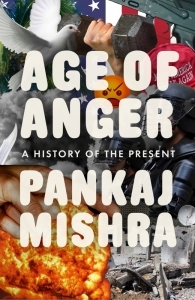 In Age of Anger: A History of the Present, Pankaj Mishra offers a take on our current predicament by tracing increased disaffection, disappointment and disillusionment back through to the eighteenth century. Packed with references drawn from various disciplines and eras, this is a book whose insights deserve thorough contemplation as we search for answers to our ‘age of anger’, writes Kate Bailey. On Tuesday 14 February 2017, author Pankaj Mishra spoke about Age of Anger for the LSE Space for Thought Literary Festival 2017. This year’s theme is Revolutions – not only marking the centenary of the Russian Revolution, but also other anniversaries of revolutions in literature, international relations, politics, religion and science. Tickets to all events are free and available here. Age of Anger: A History of the Present. Pankaj Mishra. Penguin. 2016. It seemed oddly fitting that during the week Donald Trump was inaugurated as President of the United States, a copy of Pankaj Mishra’s Age of Anger: A History of the Present arrived on my desk. The front cover is a collage of images: an explosion; a pointed finger; a dove; an angry emoji face; and the now infamous red hat that blares ‘Make America Great Again’. Looking at it, you can’t help but get an impression of chaos, aggression and conflict: appropriate, then, for a book that focuses in on the idea of a rise of anger and hatred within societies around the world. Age of Anger examines social changes and developments across a range of historical periods (roughly starting in the eighteenth century and working up to the present day) in an attempt to explain how and why we have reached a point where hatred and anger in the forms of nationalism, racism and misogyny seem to be on the rise and forming the basis of movements worldwide. I found it to be a book that at first overwhelms with the amount of information it contains and tries to communicate: the prologue throws you in at the deep end with references from poets, philosophers, contemporary politics and critiques of the construction of history, all drawn from multiple eras. However, once you get used to the style and structure, it becomes an engaging and thought-provoking read. I would still advise readers, though, to take it slowly: it is a text (and indeed topic) that deserves and requires contemplation rather than rapidity. Mishra has also included a list of all the texts discussed in the back of the book, organised by chapter, so readers are able to explore for themselves any literature he refers to that sparks their interest. In his own words, Mishra has described the book as exploring a ‘climate of ideas, a structure of feeling, and cognitive disposition’ (original emphasis): it is not, he stresses, offered as an ‘intellectual history’ that constructs a single narrative of the many and varied developments that have occurred over the past two centuries. Given the breadth of the topic, one would imagine that such a narrative would be impossible, or at the very least an inadequate exploration of this period of history. Yet, the decision to structure the book in this manner allows greater freedom in terms of the topics it explores, the examples of history it discusses and the sources it draws upon. This is an advantage in terms of the reader getting a detailed and alternative look at developments within society across history; at times, however, I did wonder that perhaps on occasion the examples have been selected and described to fit with the argument Mishra presents, rather than discussing the event in all its necessary historical complexity. This may be where the notion of a ‘climate of ideas’ comes into play: the book is not intended to provide readers with a detailed history lesson, but rather with an insight into feelings at that time. At its heart, then, the book centres in on people, their thoughts and their feelings. The emphasis is very much on the subjective experience, which is reflected in Mishra’s use of sources: poets and novelists take centre-stage, and Mishra frequently refers to the writings of Voltaire and Rousseau. This is a definite strength of the book: when reading it, one is forced to ask whether such a discussion (changes in society, the rise of new movements) could actually work as well without people being the focal point. These changes, whether in the 1700s or the present day, are the results of actions on the part of individuals and of groups: they are not abstract. One of the first examples Mishra discusses is the occupation of the town of Fiume, Italy, by the Italian poet Gabriele D’Annunzio in 1919: the occupation only lasted fifteen months but Mussolini’s fascism (another movement Mishra refers to) continued many of the ideas D’Annunzio had promoted and acted upon during this time. Mishra also discusses movements such as the French Revolution; the rise of Hindu nationalism in India; Catherine of Russia’s ascension to the throne in 1762; and the Iranian Revolution. The book argues that, coupled with the rise of the individual, has been an increase in discontent and disappointment as the modern world fails to live up to the promises made by the ‘elite’ and the expectations of the ‘masses’. Such disaffection creates a space for demagogues who promise security in an unsecure world. ‘The appeal of demagogues’, Mishra writes, ‘lies in their ability to take generalized discontent, the mood of drift, resentment, disillusionment and economic shakiness, and transform it into a plan for doing something’. There are repeated mentions throughout of the role that men particularly play in these movements, showing that amongst other resentments in the modern world is one concerning women and their change in position and status: put more bluntly, the rise in open misogyny. Given the support that campaigns like Trump’s and indeed organisations like ISIS have received from women, I would have been interested to hear more of Mishra’s thoughts on how he perceives women to fit in with these movements that seem to, if anything, restrict rather than benefit them. collective affirmations of Western freedoms and privileges […] have turned into an emotional and intellectual reflex. As the carnage of the Middle East reaches American and European cities, citizens are ushered by politicians and the media into collective grieving and commemorations of the moral and cultural superiority of their nation and civilization. This rose-tinted view of the modernised West does nothing to help understand why terrorist organisations emerge, which is nothing if not a redundant position when attempting to stop attacks from happening. Mishra’s closing words to the book nonetheless remind us that in the face of this ‘age of anger’, there is a need for ‘some truly transformative thinking, about both the self and the world’– and this book may just be a starting point for that. Kate Bailey is a PhD student in the History Department at Lancaster University, UK. Her research is currently examining the memorialisation of the ‘disappeared’ in Guatemala, looking at the use of street art, art exhibitions, museums and public events as forms of alternative memorial. Follow her on Twitter here: @KH_Bailey. Read more reviews by Kate Bailey.